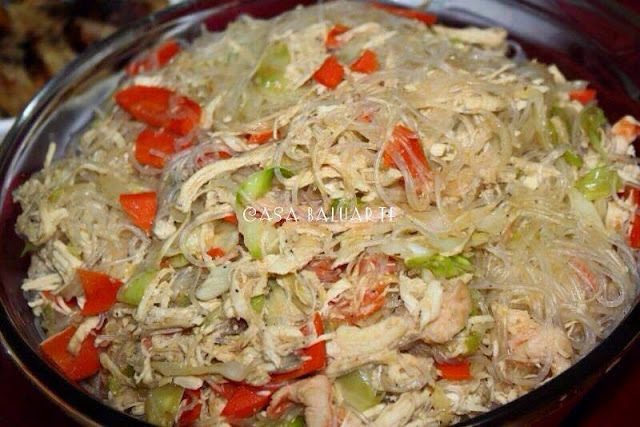 A simple no fuss and healthy Chicken Sotanghon recipe. Soak sotanghon in a deep basin using warm water for few minutes. Cut sotanghon into desired lengths using a scissor. Drain sotanghon and set aside. Add slices of chicken. Saute till chicken is fully cooked. Add the carrots, celery and cabbage. Stir well for few minutes and remove the mixture from the wok and set aside. Using the same wok bring 3-4 cups of water to boil in medium high heat. Add Knorr chicken cubes and soy sauce to the boiling water. Once the broth starts boiling reduce heat to low and add the sotanghon. Simmer for 5-10 minutes. Check every few minutes if the sotanghon is fully cooked. *If you think the sotanghon is not fully cooked and need more water you can always add more but make sure to use hot water. Lastly add the sauteed chicken and veggies. Mix well and simmer for few more minutes and serve hot.